I enjoy a good book – yes, the paper kind. I enjoy the feel of it in my hands, turning pages, dog-earing corners, and making notes in the margins. But I wasn’t always a fan of reading. In fact, I kind of hated it in school. I was good with academic books (learning was enjoyable); but I cringed at the thought of reading a ‘non-essential’, specially if I wasn’t personally interested in the topic or (gasp) preparing book reports. I remember reading just enough to get sufficient information to complete the report – boy, was I missing out on the good stuff! Fast forward through the years, and I recognized the tremendous value books provide. I was no sooner diving into the pages myself, as I was passing down that same interest to my children (both of whom are avid readers and learners.) Today you’ll find me with one or two books on the go – business, fiction, biography or self-help literature. I prefer to focus on no more than a couple of books at a time because I like to immerse myself in the content – get into character or take my new learnings and put them into action. My most recent read was Waking Up In Winter by Cheryl Richardson – a successful business woman in her mid-fifties contemplating and striving to attain balance between her continuing passion to help others through her coaching and teaching, with her desire to enjoy the very rewards of her success. This one was recommended by a couple of friends as well as my business coach – to whom I say thank you! it was a great read! I’ve found these educational, empowering, comforting and helpful – and that I think could be meaningful to you too. Year of Yes by Shonda Rhimes – Inspiring and empowering is how I describe this book – watching Shonda discover her true self and embrace opportunity, as she goes from a shy, “no” girl – wanting nothing to do with the limelight – to the super talented creator/executive producer of some of television’s greatest award-winning shows like Grey’s Anatomy, Scandal and How to Get Away with Murder (I happen to love them all, but you don’t have to be a fan to identify with the writer.) One day her sister tells her “you never say yes to anything,” and that was enough to challenge her to one full year of saying yes to everything that crossed her path. An introvert, Shonda is also very funny – and I bet she can help you uncover your own bad-assery! The Big Leap by Gay Hendricks – The book’s subtitle tells it all: “Conquer Your Hidden Fear and Take Life to the Next Level”. From recognizing to confronting and overcoming your fears, Gay Hendricks offers practical guidance to help you achieve true potential and success. As a business owner, sometimes I find myself overwhelmed by the responsibility of owning and operating a business. It’s frustrating (can you relate?) The Big Leap helped me gain clarity in the direction of my business and encouraged me to pick a lane and just take the next step. I love the Ultimate Success Mantra mentioned in the book and use it regularly to strengthen my own presence – in business and in life. 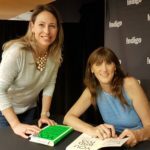 You are a Badass by Jen Sincero – I had the pleasure of meeting Jen Sincero at a book signing in Toronto. What energy! Jen introduced her follow-up book, You are a Badass at Making Money, and captured the audience as she shared some of her own challenges and strategies to financial success. I admit – I’ve only skimmed through the second book, but You are a Badass is definitely on my list of repeats for this year. The One Thing by Gary Keller with Jay Papasan – achieve extraordinary results by focusing on one thing at a time. Sounds simple yet sometimes that one thing can be complex or overwhelming, or it can be derailed by distractions, interruptions doubt or limiting beliefs. Great learning here to reduce stress and increase results – in business and in life – by knowing and focusing on your one thing. Eat That Frog by Brian Tracy – Procrastinators beware – the time has come to get things done! And Brian Tracy offers 21 ways to help you do just that. It’s a quick and easy read, and each chapter offers an effective and practical exercise to help you slay that to-do list. Nonstop Sales Boom by Colleen Francis – Sales is not my favourite hat to wear as a business owner! It can be ‘icky’ territory for some, but a necessity to business success. If your sales are like a roller coaster – up, down, up down – then Colleen offers practical and effective strategies for increasing consistent results. I’m still reading this one but finding nuggets at nearly every page turn. Sales is an area that I need to become better at, and after listening to Colleen at a workshop, and all I can say is that she can make sales appealing. 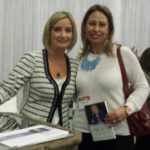 Pilot to Profit by Lisa Larter – I couldn’t list some of my favourite books without mentioning the one written by my business coach. After purchasing her book and attending her workshops, I’m now in Lisa’s group coaching program. To say that she’s a wealth of information and one of the most generous people I know is an understatement (ask anyone else who’s been in contact with her.) This book offers powerful guidance and strategies to help you run a sustainable and profitable business. It has inspired and motivated me to put measures in place to turn my business around, as has the story behind Lisa’s own journey. 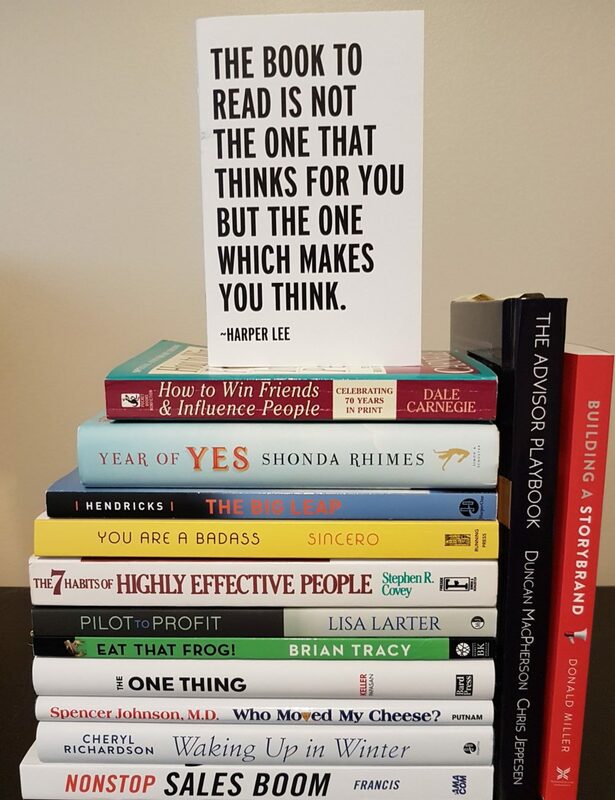 A few older books that I think are very much worth noting include The 7 Habits of Highly Effective People by Stephen R. Covey (dare I call it a classic of sorts), How to Win Friends and Influence People by Dale Carnegie, and The Alchemist by Paulo Coelho. Currently keeping me engaged are Building a Story Brand by Donald Miller to help me get crystal clear on my (re)brand messaging, and on the fictional side, Adultery by Paulo Coelho. I hope this list is useful and inspires you to head to your local library or bookstore, or download the e-version of a book that will nourish your mind, heart and spirit. Cheers to the next chapter of you!